Incident Details: A lady, walking on the path alongside the Borrowdale Yews, tripped and fell. She sustained an ankle injury and a minor head wound. A Team member who lives locally raised the alarm, and carried out immediate First Aid. The Team sent one vehicle, whilst other members stood by at base. 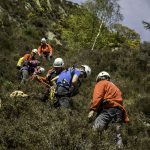 The Team administered analgesia, splinted her ankle, and then stretchered her to Seathwaite where she was transferred to an ambulance. 13 members – 1 hour 44 minutes.